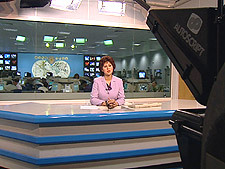 Founded in 1996, Al Jazeera ("The Island" in Arabic) was the first 24-hour news channel in the Arab world. Little known in the U.S. until September 11th, the notoriety of this "Arab CNN" has exploded since then, and has grown during the wars in Afghanistan and Iraq. Shot on location in Doha, Qatar, AL JAZEERA takes us behind the scenes of the Arab world's independent satellite TV channel. With a multi-national staff of seventy journalists and numerous international correspondents, Al Jazeera embodies the idea of a unified Pan-Arab world. The film explores the paradoxes that emerge between the apparent orthodoxy of Arab societies, and the journalistic freedom flaunted by Al Jazeera. The station's philosophy of open debate is not easily embraced in what Fayçal Al-Quassam, the host of The Opposite Direction, calls "a dictatorial, single-party culture which does not know the meaning of dialogue." 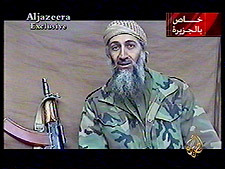 An excerpt from his program in which a former Algerian Prime Minister storms off the set, condemning Al Jazeera as, "a place of folklore and lies", illustrates the conflict. Al Jazeera's impact extends far beyond the Arab world. In Afghanistan when Al Jazeera correspondent Youssef Al-Chouli's exclusive stories from Kandahar show the impact of U.S. bombing on Afghani civilians, Washington correspondent Hafez Al-Mirazi questions Secretary of Defense Donald Rumsfeld about them. He interviews National Security Advisor Condoleeza Rice, who states her support for Al Jazeera - but one month later, when their Kabul office is bombed, some journalists can only respond with suspicion. Combining news footage, excepts from various Al Jazeera programs, and interviews with executives, anchors, and journalists (from Yousri Fouda, trying to uncover stories on the Guantanamo detention camp, to the first Arab female sports reporter, Leila Smati), AL JAZEERA is an invaluable look at the challenges faced and issues raised by the most important television channel in the Arab world.